[T]here is something in prose, inserted poems or even just a reference to a poem, or a noticeable change of irregular language into a harmonic and rhythmical form that will distinguish these texts from others which do not make us consider poetry at all. 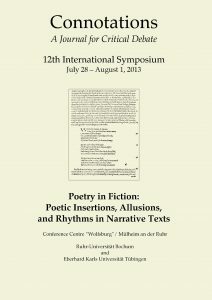 Whether we regard this presence of poetry as contrastive, dialogic and complementary, or whether we see a transformation and perhaps elevation into poetry, or whether this arrangement makes us realize that there is actually no prose without poetry (and vice versa)—in each case the coexistence of prose and verse, of poetry and narrative fiction will have a metapoetic dimension, showing us literature aware of all its options to extend its reach. Embedded and Embodied Poetry in Edgar Allan Poe's "Ligeia" and "The Fall of the House of Usher"